Roads once belonged to pedestrians. The space was used for markets, cattle, horse wagons, dancing, or meetings. Perhaps modern days’ block parties, with their restricted traffic, give a taste of what roads once were in terms of a place for people. Then came the cars. At first they were slow, but nevertheless exciting and they quickly became fashionable. However, it was not long before the first collisions occurred between cars and pedestrians. The need for road safety and traffic management was born. Early traffic engineers suggested that cars and pedestrians should be segregated. Roads for cars, sidewalks for everyone else. As cities and traffic grew, the methods to ensure road safety became more sophisticated. Interventions such as traffic lights, warnings, prohibitions, instructions, speed limits, circulation points, markings on the road, and speed bumps followed. But as more redundancy and barriers were added to the system, the complexity increased, making it ever more difficult to ensure safety. Then came Hans Monderman. This Dutch traffic engineer was given the task of reducing speeds on a particular street in the central parts of Drachten, a city in the north of Holland. 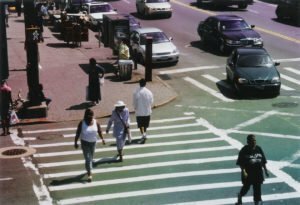 Monderman’s thesis was that drivers were speeding because they felt that the road belonged to them – that they had the right of way over pedestrians. In a way, all the traditional safety measures removed the need for drivers to use caution, to look ahead, to interact with other people. Drivers could rely on the system. Or at least, that was what Monderman hypothesized about drivers. The first attempt to change this, aimed at giving drivers a sense that the road did not belong to them. Monderman planted flowers and plants in and around the streets. This to give drivers the impression they were driving in a garden, belonging to someone else. The average speed dropped with 10%. This was enough to encourage Monderman to keep exploring the idea. He went on to suggest a radical approach: A total removal of everything that traditionally kept cars and pedestrians separated. No signs, no kerbs, no traffic lights, no speed limits, no marking on the roads. Just a shared space. And this on a street which had more than 20,000 vehicles per day. Revoked of external clues as to what was safe and not, drivers and pedestrians alike had to rely on their own internal assessments of a situation. The uncertainty triggered a more cautious driving style. But also, to solve conflicting situations, people had to seek eye contact, to read people’s intentions from their behaviour, to sort things out for themselves. The result? Speeds dropped with 40%, the traffic flowed better, and while accidents and injuries still happen, these are minor events, with smaller consequences – events that are easier to learn from. Have a look at the video below to see the shared space in action. If you’re interested to learn more about how shared space is being used and rolled out across the world, you can read more here. Very interesting! I read about this a couple of years ago and am glad to have the reference. In particular, I am interested in the factors that made this traffic intervention successful. Driver attitude, culture and lots of cars (20,000) were described in your blog. In my rural Canadian community of 5000 people, we have had our first stop sign installed in the town’s centre, and it is very controversial. This stretch of town has everything on it and is busy with pedestrians and vehicles. I would describe the driving culture as senior citizen and tired ranchers and loggers – not very agressive, but driving too fast was one of the reasons for putting in a stop sign. 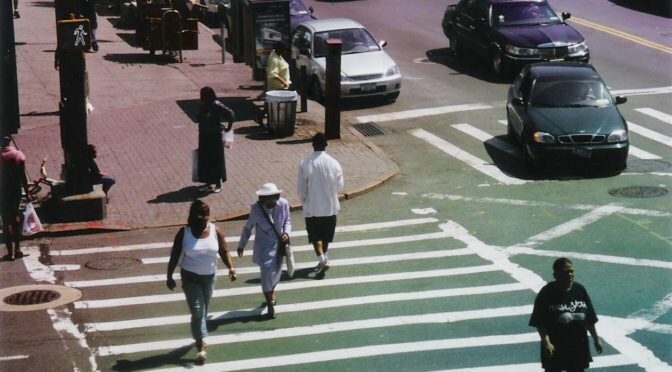 I find now that my attention is focussed on the stopping at the stop sign, whereas before I would drive slowly along looking left and right for pedestrians and cars pulling in or out – and often in this small town we stop and let people go. I am wondering what human factors have changed because of this new stop sign – not attitude, but perhaps attention focus? Monderman said about traffic lights that they make people speed like hell, and brake like idiots. Has your town’s stop sign had a similar, very localised, effect on speed? So far, people in this small town are still blasting through the stop sign. Years of not stopping will not change overnight. I think the effects will be better seen in a bout a year, once people get used to having a stop sign to stop at.